Most ferret vets, ferret organizations, and ferret experts recommend caging your ferrets when they are in your home unsupervised because ferrets are more prone to injuries than other companion animals when given free roam. Ferrets should also be able to move around easily and stretch their muscles. Multiple levels, separated by ramps, are preferable. No sources agree on just how big a ferret’s enclosure should be. The Humane Society of the United States recommends 18 inches long, 18 inches deep, and 30 inches wide (45.72 cm x 45.72 cm x 76.2 cm). However, the Companion Avian and Exotic Pet Medicine and Surgery Service at the University of California, Davis recommends 24 inches long, 24 inches wide, and 18 inches high (60.96 cm x 60.96 cm x 45.72 cm). 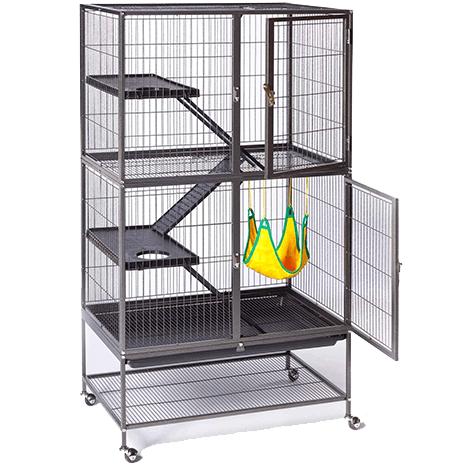 Many ferret organizations and vets recommend the Ferret Nation cage, the single unit of which is 36 inches long, 25 inches wide, and 38.5 inches high (91.44 cm x 63.5 cm x 97.79 cm). A cage should have adequate ventilation and be an appropriate temperature. Do not use an aquarium or other type of cage with solid walls as these do not get enough ventilation and are unsanitary. 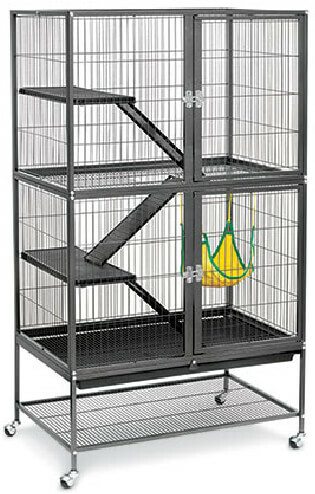 A ferret cage should be made of sturdy metal or wire bars. 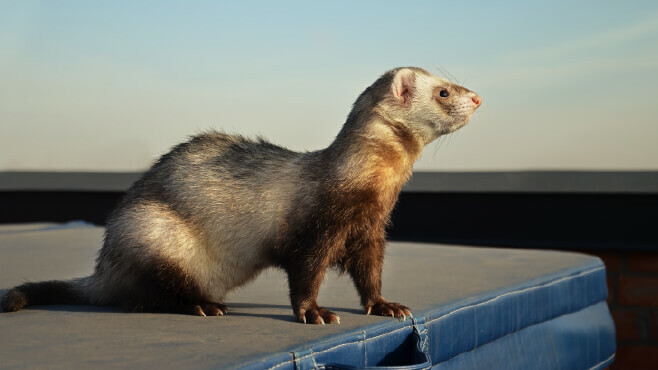 Ferrets should be kept in the shade (if outdoors), and the temperature should be moderate. 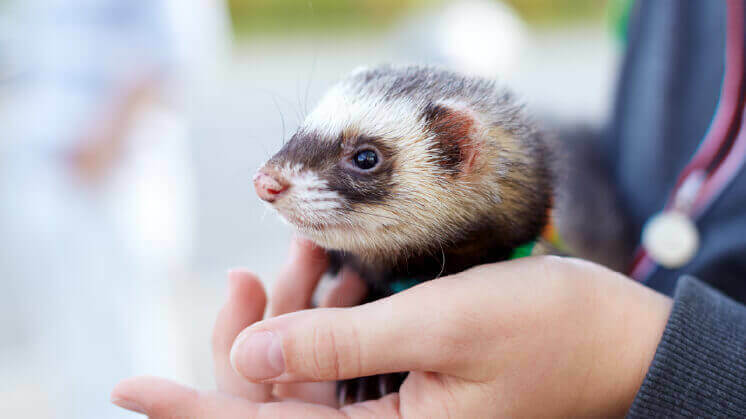 The Humane Society of the United States recommends 55-70℉ (13-21℃), whereas the American Ferret Association recommends between 50-80℉ (10-27℃). Ensure that any wires/bars are no more than 1 inch (2.54 cm) apart, since ferrets may be able to squeeze through larger openings. The wires/bars should also be strong and thick so they cannot be bent. Ferrets are smart, so the locking mechanism of the cage should not just be complicated. It should be impossible for your ferret to open, even if they figure out how to do it! Unpainted metal bars. Some ferrets like to chew on cage bars even when they are unhappy. If the metal bars of the cage are painted, then this means those ferrets will end up ingesting paint. Look for cages that don’t have paint on the bars. 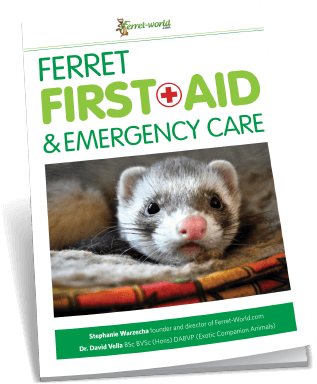 This may seem like an unimportant feature if you’re a first-time ferret owner, but it is crucial. Ferrets want their cage to be clean and sanitary. It’s very difficult to maintain that environment if you are working through a tiny door that can only fit your arm. Full-width double front doors, which allow you to open the entire front of the cage, making it easy for you to clean and rearrange inside. Removable plastic trays for flooring, so that you can easily remove the flooring from the cage to wash it. This is particularly nice if you have a hose and your ferret poops all over the floor! Scatter guards can prevent your ferret from pushing litter or pooping over the side of the flooring. For all of the cages below, we recommend the double cage, even if you have a single ferret. The double cage is typically advertised for 2-4 ferrets, but we at Ferret-World.com believe it is more appropriate for 1-3 ferrets. A single ferret will love all the extra room and without cagemates, may actually require more stimulation in cage than a paired ferret would. The Ferret Nation cage is by far the most popular with educated ferret owners and ferret vets. This is because this cage has all of the features you should look for in a cage, in addition to being sturdy and relatively attractive. The Ferret Nation has bars spaced 1 inch (2.54 centimeters) apart. It contains plastic trays and covered ramps to protect ferret paws. The cage closure allows for one-handed use but is impossible for even the cleverest ferret to open. The bars have an attractive finished but are not painted. Ease of cleaning. The cage comes with plastic trays to cover the floor, which remove easily for cleaning. 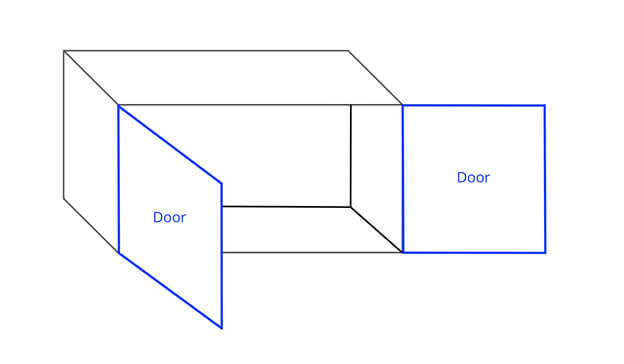 Both sets of front doors open wide, allowing you full access to the inside of the cage. The cage is a bit of a struggle to put together and most folks put it together wrong, then have to pull it apart and try again. Personally, I’ve put together a Ferret Nation cage three times and have done this each and every time. However, the cage is worth the effort and does easily come apart for travel and moves. This is one of the most expensive cages on the market, typically $250 USD. However, it is not overpriced in our opinion. A high-quality cage will simply cost more money. 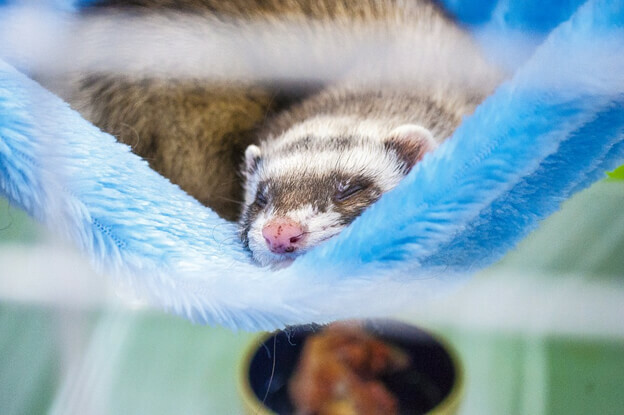 While it’s relatively easy to get the Ferret Nation cage in the United States and Canada, it’s harder to come by in other countries. 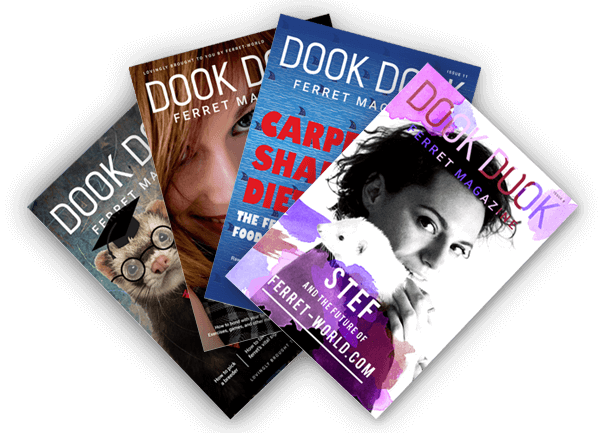 If you live in Australia, we recommend our silver medalist, the Ferret Kingdom by Puppy Power. 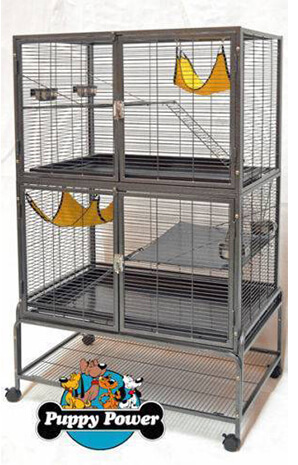 Note: There is another Ferret Kingdom cage made by Super Pet. We do NOT recommend that cage. Size. The Ferret Kingdom is the exact same size as the Ferret Nation, making it also one of the largest cages on the market. The Ferret Kingdom bars are spaced 0.5 inches (1.25 centimeters) apart. It contains plastic trays and covered ramps to protect ferret paws. The clasp is not necessarily ferret-proof, but there is a tiny clasp at the top of the doors that keeps it closed. The bars have an attractive finished but are not painted. Ease of cleaning. Like the Ferret Nation, the cage comes with plastic trays to cover the floor, which remove easily for cleaning. Both sets of front doors open wide, allowing you full access to the inside of the cage. Putting this cage together is easy and quick. The Ferret Kingdom costs a little more than the Ferret Nation cage at approximately $285 USD ($385 AUD). This cage is only available in Australia. Additionally, only a single eBay seller, puppypower_77, sells the cage and it is usually not available. 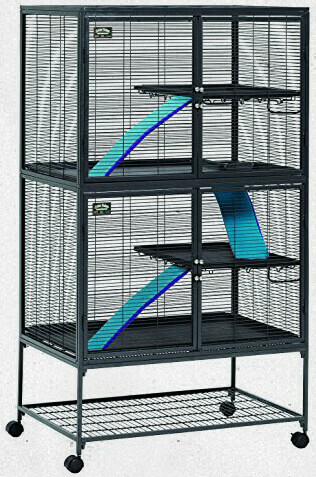 Ferret owners wanting this cage have to watch the eBay shop and wait for it to appear.